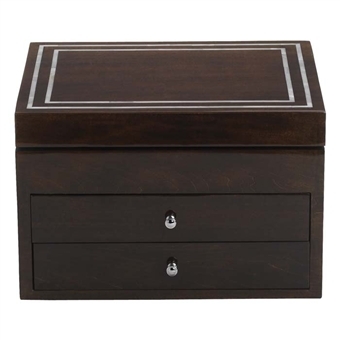 Pretty and sleek, our newest jewelry box arrival features a dark cherry finish and double inlaid border of genuine Mother of Pearl. 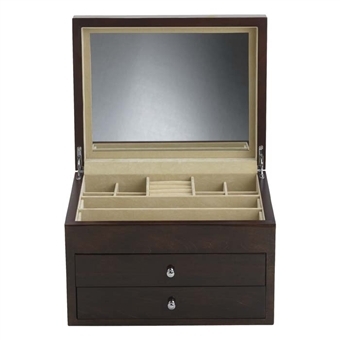 Handcrafted with careful attention to detail, this gorgeous jewelry chest has nickel finished knobs, quadrant hinges, a full mirror in the lid and is completely lined to protect fine jewelry. Measuring 12 1/2" in length, 10" in height and 8" wide, it's a nice size to keep on a dresser or vanity, with ample room to keep jewelry organized. A perfect gift for someone who prefers a classic look with a bit of personality. Bottom drawer: fitted for pendants, bracelets etc.